This work is metaphorical exploration of the traffic in Lisbon of a living organisms with circulatory problems. We use an adaptive physics system to build and manipulate the road network – the thickness, the color and the length of the vessels are excited by the number of vehicles and average velocity in each road. With this system we try to bypass the strictness of contemporary visualizations that depict data accurately through direct mappings. We started by using a more direct approach. In the following visualization slow vehicles appear as red dots, depicting problematic spots as clots in a living organism. 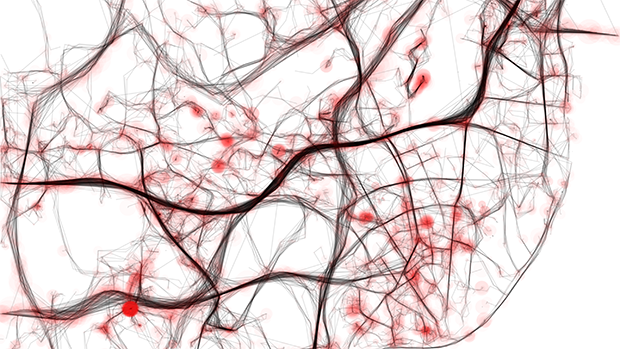 The road network of Lisbon was queried from OpenSreetMap, parsed and filtered. Using this information, a spring based physics system was built for the road network. Data is overlaid on the resultant structure in order to excite the system as follows: a greater number of vehicles on a vessel tend to make it thicker, higher speeds tend to contract its length (and vice-versa). The latter behavior was chosen in order to transmit a global impression of the perceived distances within the city. This behavior shrinks the city when the traffic velocities are higher, and distends it in the rush hours when the city faces congestion problems. This way we morph the city’s shape in order to depict the perceived distances within the city, bypassing the common perception based on its geographical mapping. For coloring, lower speeds imply the darkening of a vessel, expressing slower circulation and stagnant blood. The vessel’s visualization in the previous video has crude aesthetics that we think are innate to the visual metaphor of an organism with circulatory problems, pulsating for each rush hour and stressing precisely which roads are congested. It is interesting to notice how the city stays compressed during the evening, and how it abruptly expands during the rush hours: 8h-9h and 18h-19h. It is also interesting to observe that the 8h-9h period is by far the most problematic. Because polishing the aesthetics of each artifact is something that really drives us, we experimented a more realistic approach. In this final rendering, vessels are seen on a dark background as they would be in any organism, and the vessels were given more flesh like colors. Furthermore we implemented a “pumping blood” behavior that is related with the vehicle’s velocity – higher velocities imply higher pulsating rates. Moreover we also opted to represent the number of vehicles in each vein, as if they were cells on a blood stream: the number of cells is proportional to the number of vehicles in each artery. In this artifact we also exaggerated the amount of distortion for each vein in order to attain a more caricatural visualization. 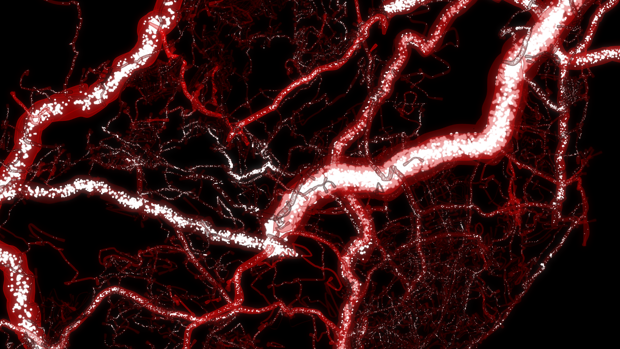 Honorable Mention, Lisbon’s Blood Vessels – A mapping experiment on the MiniMax Mapping Contest, École Polytechnique Fédérale de Lausanne, 2011. P. Cruz and P. Machado, “Stadtportraits und Stadtkarikaturen,” in Die Stadt Entschlusseln: Wie Echtzeitdaten Den Urbanismus Verandern: Wie Echtzeitdaten den Urbanismus verändern, D. Offenhuber and C. Ratti, Eds., Berlin: Birkhauser, 2013, pp. 103-115. P. Cruz and P. Machado, “Visualizing the Circulatory Problems of Lisbon,” in International Conference on Computer Graphics and Interactive Techniques, SIGGRAPH 2011, Vancouver, Canada, August 7-11, 2011, Poster Proceedings, Vancouver, Canada, 2011. Data gathered in the context of the CityMotion research project coordinated by Carlos Bento, Transportation Systems focus area, MIT-Portugal program.